You are currently browsing the tag archive for the ‘cute’ tag. Apparently, on bath nights, he has been playing in the bath tub and not actually washing! He also had a slice of Limburger cheese in his pocket! “GROSS!” So tonight, with some extra supervision, Ducky got a double washing and an extra fluffing during bath time. On his way to deliver blankets and donations to animals of the North East, Ducky didn’t see a huge snow drift that had formed on the train tracks until the last second. He was busy shovelling coal into the Ducky Express’ engine. When he looked up it was too late to stop the train. Ducky jumped and rolled into a soft snow pile. However, the train headed full speed into a gigantic mountain of snow that had blown onto the train tracks. There was a huge explosion of snow powder and then slow chugging as the train’s engine struggled against the snow. Ducky inspected the wreckage to find that the train was completely stuck. What would he do? He needed to get those supplies to the animals, but how? Not again. Pembleton is going to be so mad! 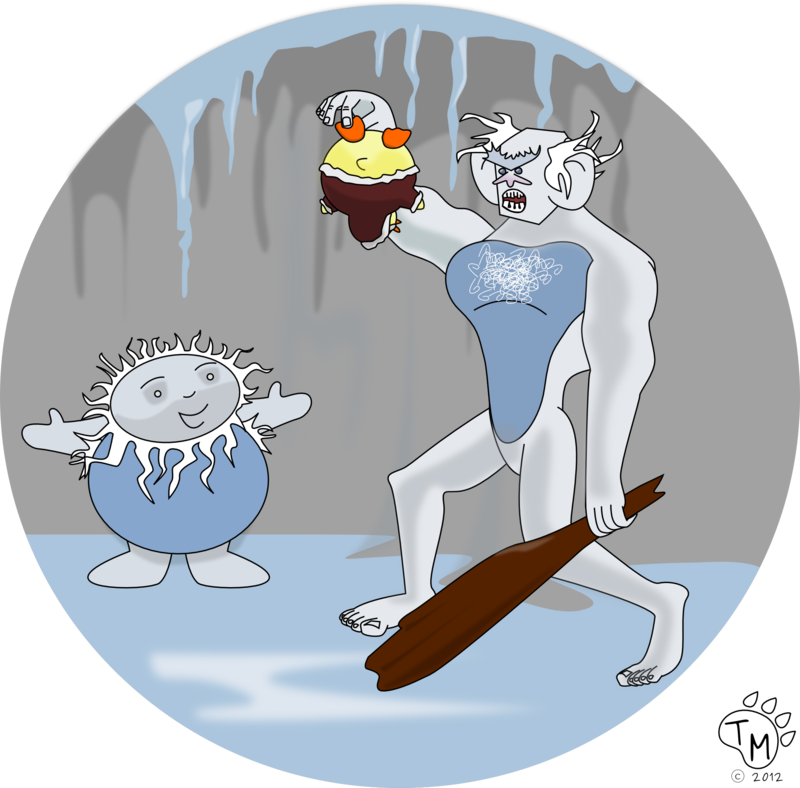 Ducky was outside exploring the frozen north when he was attacked by a giant blue, grumpy monster. The monster grabbed Ducky by the foot and brought him back to his icy cave. Lucky, when Ducky arrived the monsters son, Edgar knew how to speak animal. 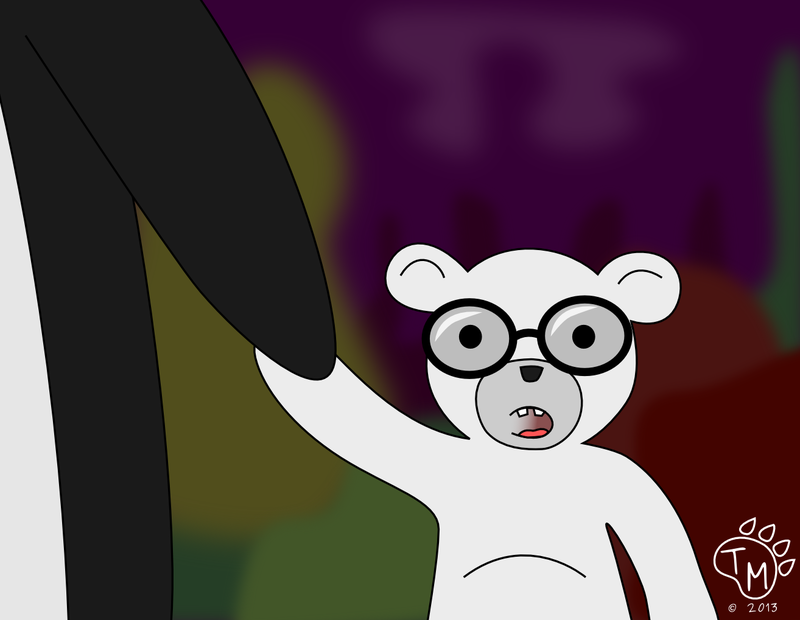 Ducky learned that Edgar and his father are Yeti and that Edgar’s father was grumpy due to his male pattern baldness. Ducky told Edgar that he could acquire a wig for his father, which made him much less grumpy. When Ducky got home, he told Pembleton, Ted, and Blizzard what had happened. 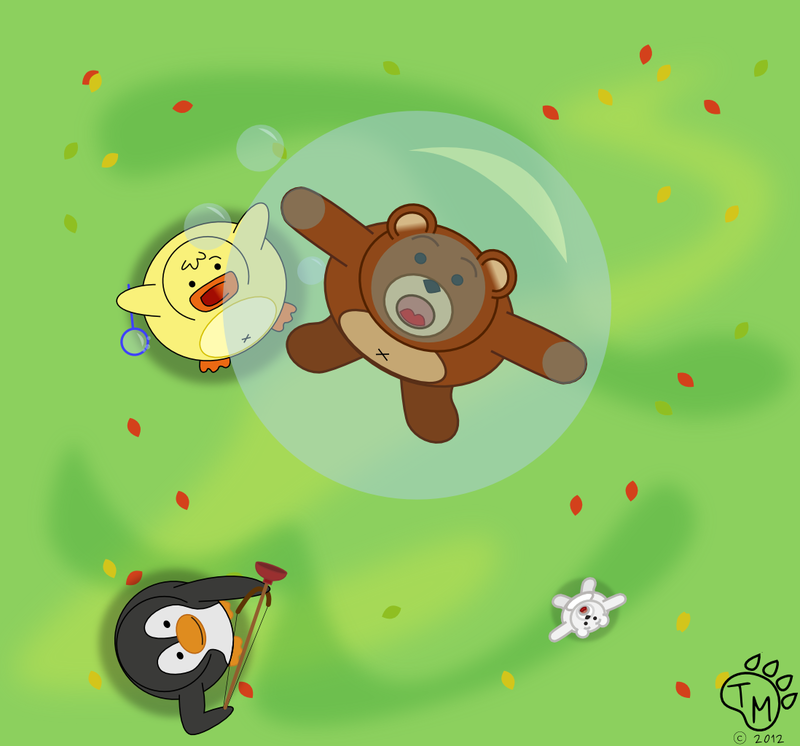 Ted and Blizzard were amazed, but Pembleton didn’t believe Ducky until Edgar waddled inside. Ducky went upstairs and found a suitable wig for Edgar’s dad, then Ducky invited the Yeti over for dinner, where they shared stories of amazing adventures. “To have a day off from school” said Rodolph the lamb. “To eat lots of pie?” Ducky Asked. 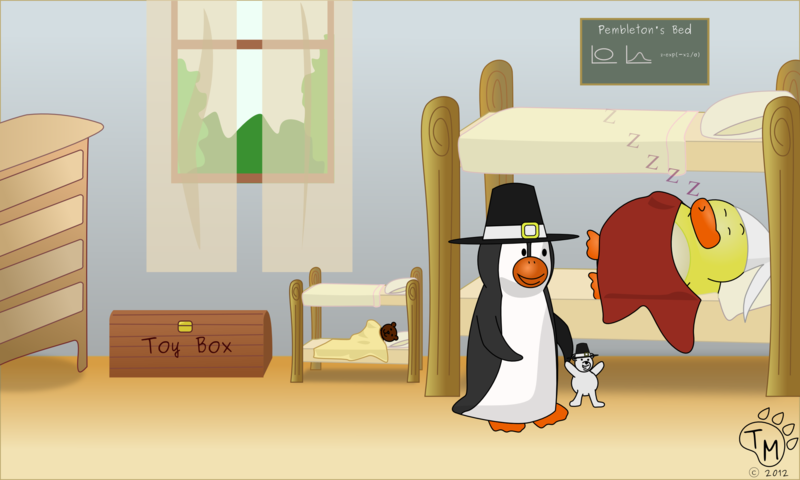 The day before Thanksgiving, Pembleton and Blizzard woke up bright and early. Ducky and Ted, however needed their beauty sleep. “Wake up, wake up. 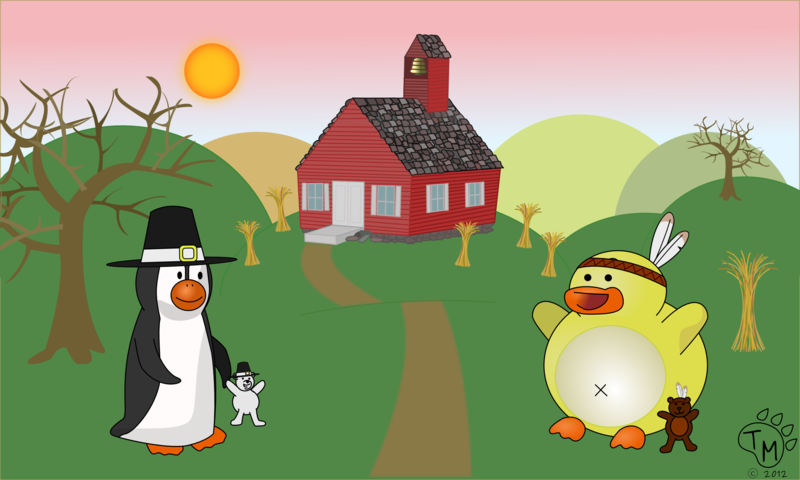 It’s time for school.” Pembleton shouted as he shook Ducky. “We have to get ready for school.” After several attempts, Ducky and Ted were finally up. 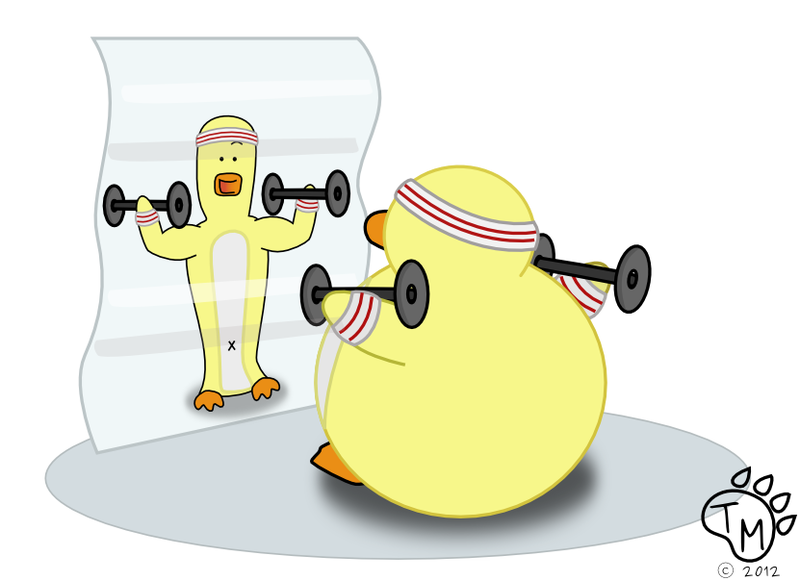 I work out!- I’m Ducky and I know it. Earlier this week, Ducky ran into Christmas Koala while shopping for some new sweat bands. As always, Christmas Koala gave him an offer, Ducky couldn’t refuse. Ducky got a gym membership at the Koala Klub for a great deal, and he is already seeing results! Ducky thinks Pembleton will be jealous. Networking is the key to a successful business! 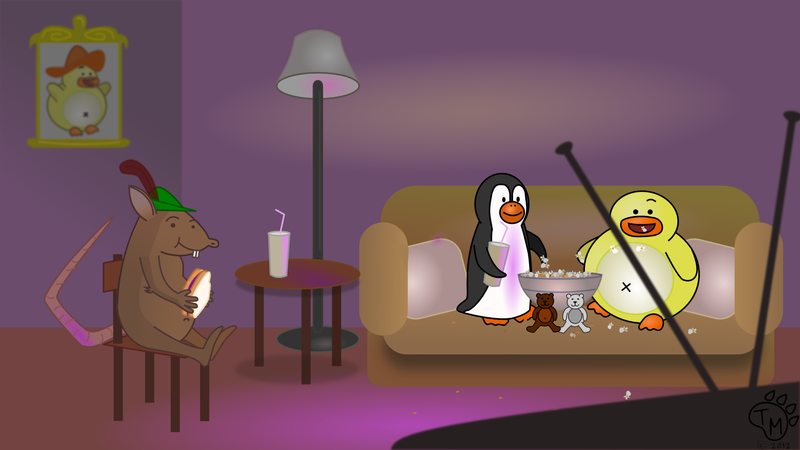 Ducky makes most of his business deals through his relationships with other animals. For example, Ducky was introduced to Christmas Koala by the Lambs, and when Ducky was in India searching for the perfect rice pudding (The Quest for the Perfect Kheer) he was able to convince the baby elephant to give him a ride because the baby elephant also knew Christmas Koala. 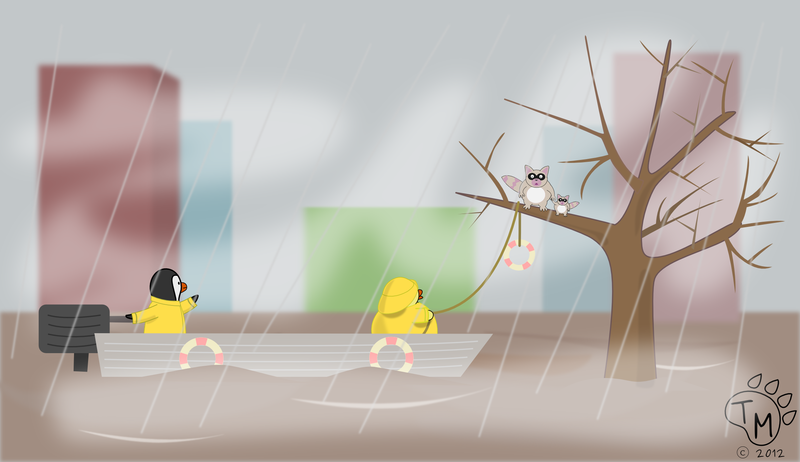 Pembleton introduced Ducky to Potbelly Phil (a decision which Pembleton still regrets), and Potbelly Phil was the animal that called in a request to rescue the racoons from a tree during the aftermath of Hurricane Sandy. 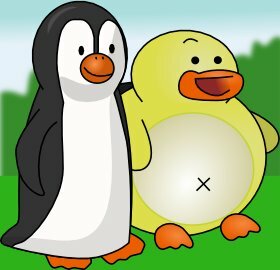 Every animal Ducky meets is a potential business customer, and the more happy customers that Ducky has, the more animals will come to him for future business. That is why networking is the key to a successful business. After school Pembleton noticed the leaves in the yard were getting out of control. He asked Ducky if he would help with the yard. Ducky happily agreed. Pembleton got the rakes out and started doing yard work. He hoped to get it all done, so they could go to a festival on Saturday. He raked and raked, making a huge pile of leaves, but Ducky was no where in sight. He went inside to warm up for a minute. When he came back out, he found Ducky, Ted, and Blizzard playing in the huge pile of leaves he just raked. After a few seconds of being annoyed, he decided to jump in as well. Then when they were all done playing, they all pitched in and finished the yard in a few minutes. 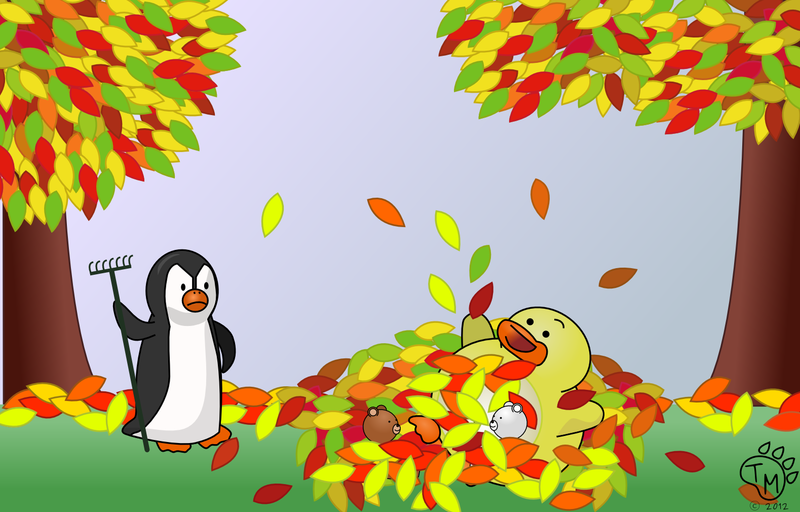 This pile of leaves is perfect for a leaf fight. Today is a special day at school. It is “Sharing Day” and everyone is bringing something to share with the class. Ted and Blizzard are bringing their favorite Pumpkin Snickerdoodle cookies to share. Pembleton is sharing his ant colony he has been raising and Ducky is sharing his blog with the class. He wants to share his stories and pictures from his adventures with the other students. He even brought a book of his stories to give to his teacher, Mrs. Cottontail, to add to their story time collection. If you had a Sharing Day at school, what would you like to share with your fellow classmates? Remember any day is a good day to share Ducky’s blog with family or friends. Who wouldn’t enjoy fun & exciting stories about little animals doing big things? Ducky went to the kitchen and came back with two halves of a shiny red caramel apple. After eating the apple, Pembleton helped to extract the apple seeds. Then they went the backyard, made a small hole in the corner of the backyard, and planted the apple seed. Until next time, Pembleton reminds you to KEEP BEING CURIOUS! If you have a question for Pembleton, leave it in the comment section. Remember to Rock the Vote! Ducky, Pembleton, and the Lambs did their civic duty today and voted. Did you? Ducky wants to remind everyone, you can always write him in on the ballot. Kids, remind your parents and any other adult you see today to VOTE! We Want You To Vote! 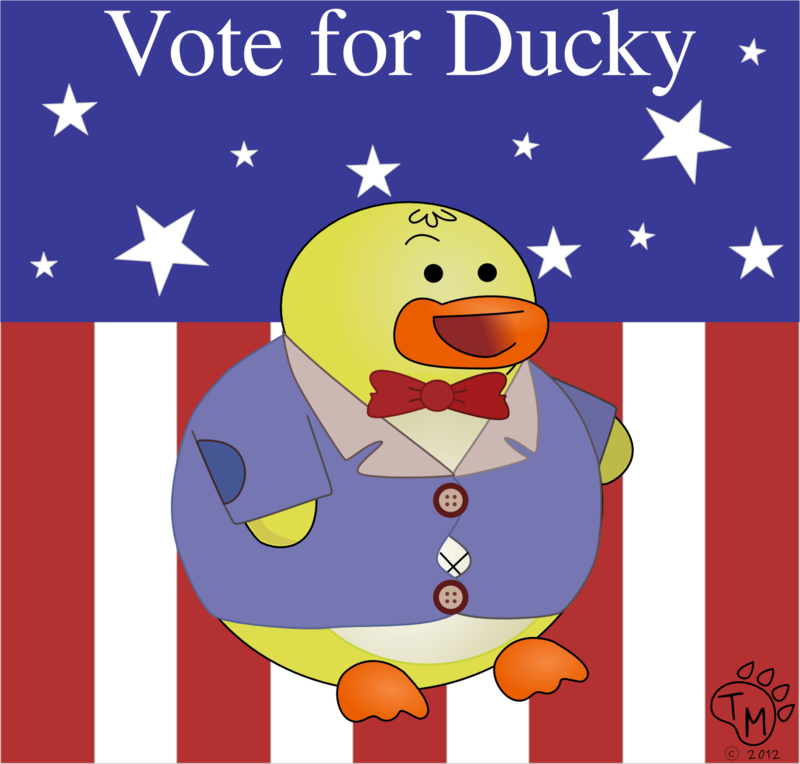 Tomorrow is Election Day and Ducky wants to remind you to vote, for him. Over the weekend, after seeing some political commercials, Ducky decided to run for President of All Humans. His background as self proclaimed Emperor of all Fowl, provides him with experience and know how on how to get the job done. Plus, Pembleton is running as his Vice President. 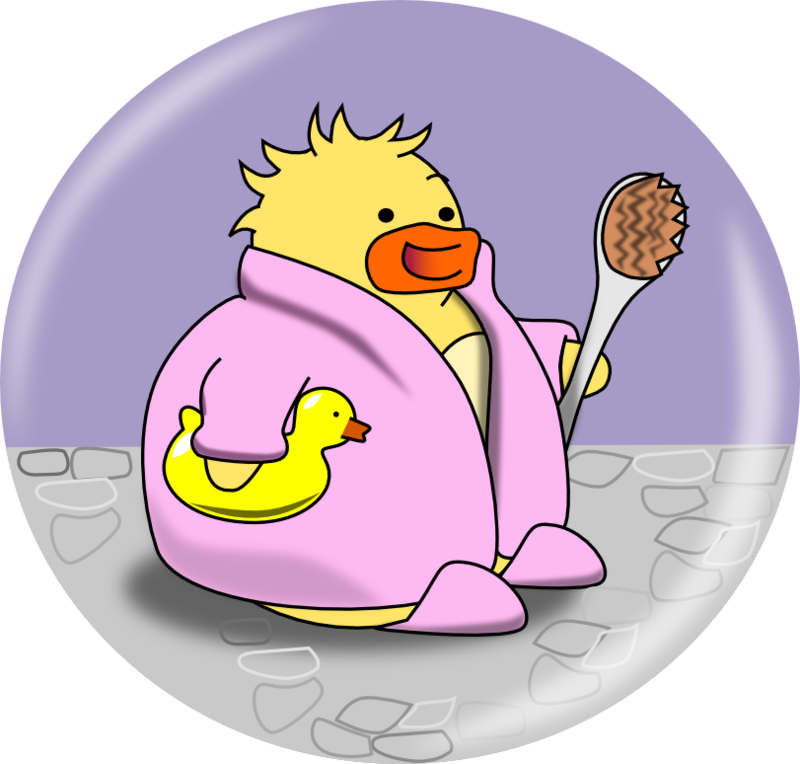 Pembleton has lots of leadership experience, and experience getting Ducky out of trouble. Snack time and Recess for all (naps optional). Stricter rules on the ownership of exotic animals. All koala sales bears must register with the Better Business Bureau. As VP, Pembleton promises to help protect Antarctica. While the gang has been having fun with Halloween this week, they have also been busy helping with Hurricane Sandy Relief. They have received several distress calls from animals who are stranded by flood waters or without food or shelter. Pembleton arranged for everyone to head up to the north east to help. The Lambs passed out blankets and snacks at an animal shelter, while Ducky and Pembleton searched for stranded animals, who needed help. If you would like to also help, please visit the Red Cross website. Last night the gang had a great time trick or treating. They got lots of candy, treats, and other sweet surprises. They also had the best costumes in the neighborhood. When they got home, they were not quite ready for bed. After their baths, the humans popped them some popcorn, and put in the movie Hocus Pocus. Shortly after the movie started, Rumpelstiltskin came out of the kitchen with a PB&J and joined them. Only Rumpelstiltskin stayed awake for the whole movie. I guess they will have to watch it again next year. This Halloween picking out the right costume wasn’t easy. There were so many good ones to choose from. But once the gang knew what they wanted, it was unanimous. Ducky would be Mr. Incredible. Ted and Blizzard both wanted to be Dash. And Pembleton wanted to be Frozone. We hope every one has a safe and fun Halloween. Ducky, Pembleton and the rest of the gang are excited to introduce Boo, The Jack-O-Lantern! They worked hard to carve him and are excited to share Boo with all the trick or treaters tomorrow! The guys examining pumpkin guts. * Check out last years Jack-O-Lantern pictures! After a couple of incidents that Ducky doesn’t want to talk about, Ducky needed his own vehicle in order to get around. He went to his piggy bank and counted all his human money- $7.28. He then went to his turtle bank and counted all his animal money- 15 lime jelly beans and a linty licorice stick. Ducky was so proud of his savings and knew he would be able to get the perfect vehicle. After collecting his money, he hopped on the city bus and headed for the Ferrari dealer. After being laughed at, he headed to the other local dealerships. No one wanted to sell him a sweet ride. Feeling defeated, Ducky remembered his friend and local mechanic, Bio-Diesel Weasel, also sold used cars. He headed over to Bio-Diesel Weasel’s shop right away. Once he laid eyes on an old timey car, he was hooked. Ducky made Bio-Diesel Weasel an offer, he couldn’t refuse. He loved lime jelly beans. Plus he owed Ducky a favor, for rescuing his cousin from a cat. Later he threw out the linty licorice stick. Ducky was now the proud owner of “Ducky Ducky Bang Bang” the loudest and oldest bucket of bolts on the block. With the help of Mr. Lamb, Ducky was ready to hit the streets at a whopping 10 miles per hour. Remember to subscribe, like, comment or add us on Facebook! 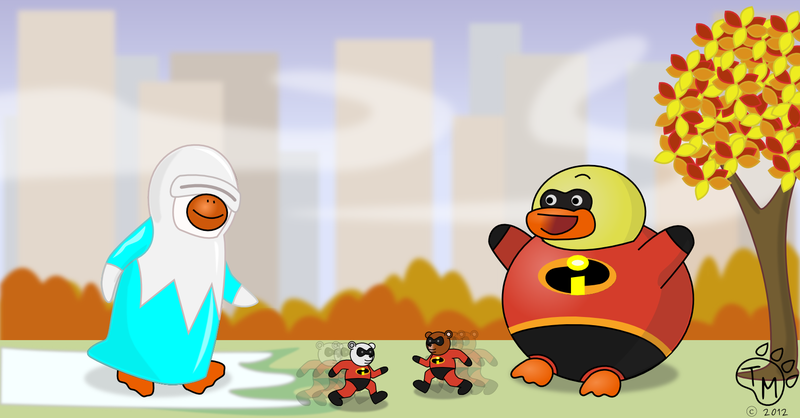 Captain Ducky and his crew set off on an interstellar voyage for the perfect snack. They vowed to “boldly go where no animal has gone before.” When they reached the planet Lambeus, they encountered two strange creatures. The creatures were making something that smelled similar to chocolate chip cookies. 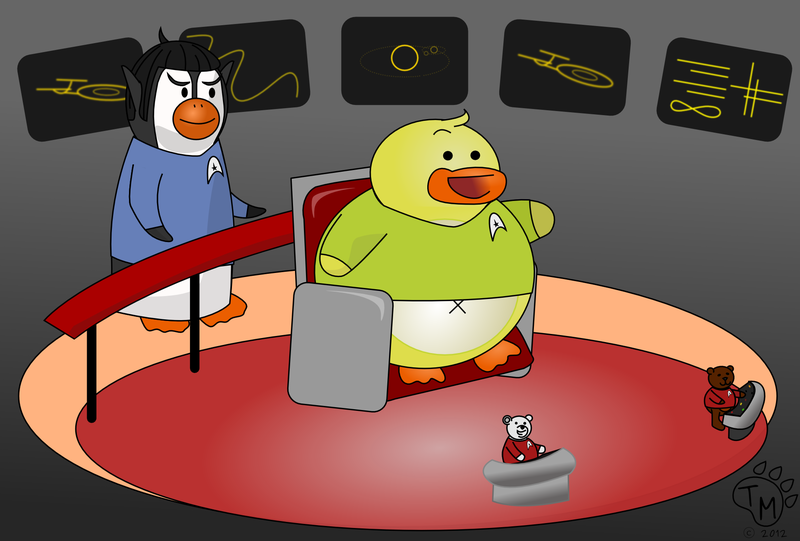 Due to the principle of non intervention, Captain Ducky suggested they take the cookies when the aliens (the Lambs) are not looking and to high tail it out of there. Pembleton agreed, stating “it is the logical thing to do.” They beamed Cadet Ted and Cadet Blizzard to the location of the cookies to retrieve them quickly, before the aliens noticed. They were safely beamed back to the ship. Before eating, Pembleton preformed a complete scan to ensure the cookies were safe. Once it was complete, they enjoyed their snack time. Ducky is a World Champion Heart-lifter. If it was an Olympic sport, Ducky would have the gold medal, no contest. What is a Champion Heart-lifter, you might ask. Well a Champion Heart-lifter, is someone with the unique gift of bringing joy and happiness to people having a rough time in life. 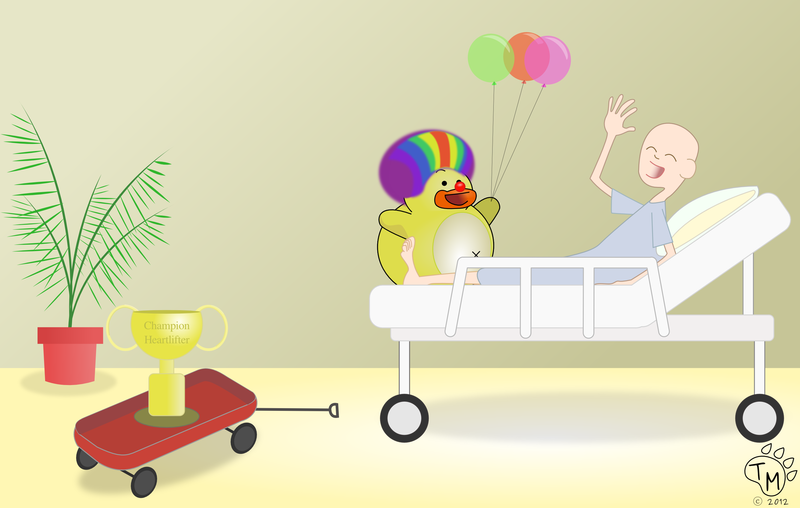 Ducky often visits children who are in the hospital, or the elderly in nursing homes to lift their hearts and make them laugh. He always enjoys sharing his snacks with them. Ducky is a Champion Heart-lifter, but you can be one too. Just be a friend to someone in need. This weekend, Ducky, Pembleton, Ted, and Blizzard flew up to Vermont to enjoy the last days of the fall berries. Pembleton came up with the idea to pick some blueberries and bring them home so that the Lambs could make a blueberry pie. When they got to Vermont, they met some of the local animals and asked them where they could find the best blueberry patch. A porcupine told them about a human farm, but Pembleton said they would have to pay the farmer, and Ducky didn’t have any money. Plus, they prefer wild blueberries because they are sweeter. Then they met a black bear cub who told them about a patch of never ending blueberry bushes in a field between two small mountains. After several hours of hiking, they finally reached the BEST BLUEBERRY PATCH IN THE WORLD! Somehow only Pembleton managed to collect blueberries for the pie, while Ducky and the Lil’ Guys got a belly ache from eating so many blueberries. Blizzard was practically all purple from blueberry juice. They had a great day. “Ducky! The blueberries are for the pie not your belly!”, said Pembleton.